Although I would have like a longer coat, in the end it just wasn't possible. 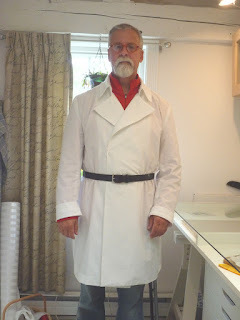 In fact, I struggled for hours to get the coat as drafted out of my limited amount of fabric. Above you can see how close I had to place the major pattern pieces. Thank God the fabric was 60" wide. The sleeves, storm flaps and collar pieces had to be orchestrated by trial and error onto the remaining fabric. 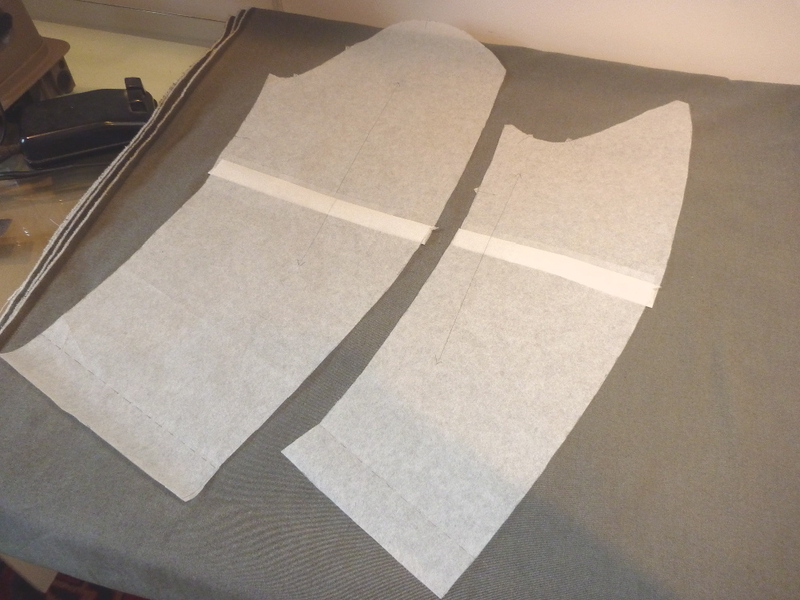 The bias cut undercollar turned out to be an impossibility, so it will be in two pieces. The undercollar has lots of decorative topstitching on it, so I don't think the center back seam will be an issue. Somehow I managed to get the smaller pieces ( pocket welts, epaulettes, belt loops, cuff straps) out of this table full of scraps. So, as much as I would have liked a longer coat, I'm sucking up my regrets and moving forward. Needless to say a valuable lesson has been learned. All of this could have been avoided for $8 ! The muslin for the trench coat is complete, so here I am with the first fitting. Overall I'm pleased with the fit. Why the sleeves are so long I haven't a clue. I can safely shorten them by at least 2". The extra 3/4" across each shoulder will allow me to wear this over heavier clothes. In these pics I'm wearing a lightweight fleece with some room to spare. 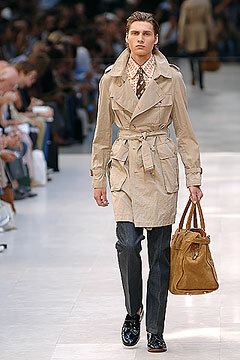 I don't know if anyone really belts a trench coat. 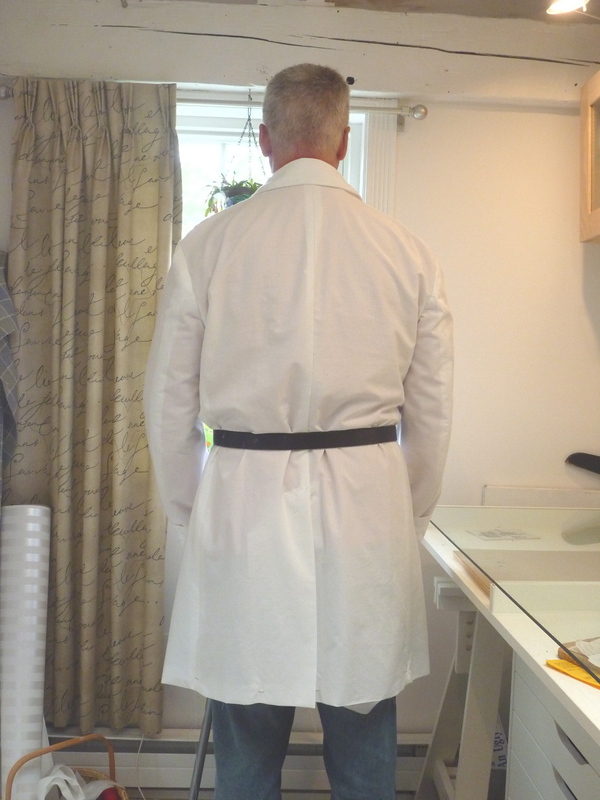 More often than not I see the belt just hanging at the sides or doubled back and fastened behind. 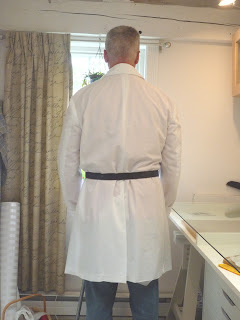 I wrapped a belt around myself just to get the visual gist of things. In all honesty I'm not 100% sold on the proportions. The belt seems to bisect the coat right in half. Am I wrong in wishing the coat were longer? Feel free to weigh in on this one. Here's a closer shot of the collar. I have to admit that the "engineering" of these Japanese patterns is superb. The collar, collar stand and front facings aligned perfectly. Usually I struggle to get one part or the other to match up. Hopefully the real collar will go together as easily as the muslin. This is one of those cases where making the muslin is well worth the time and effort. 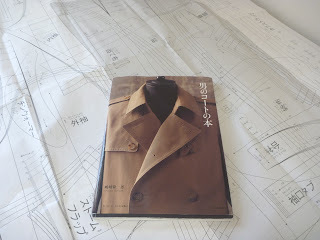 I'm going to be lining this coat and with some careful engineering I should be able to attach the lining, facing and the collar with a single seam. At least that's the theory right now. Because of my concern over the coat's length I've done a little trench research. This is an Aquascutum model. It's length from neck to hem is advertised as 94 cm , or 37" . My coat is 37.5 inches, so apparently I'm in the ballpark. BTW the coat above is $720. I think I can come in under that. 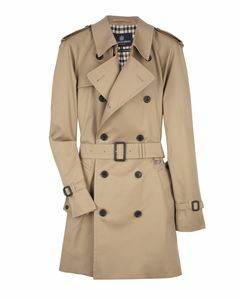 This is a Burberry trench. Again the back length is 37". A similar model is available on Bluefly for $1596. Seriously???? The Brooks Brothers model varies from 38 to 40" in length. Dear readers, what's your opinion? Should I try to eek out a little more length? I'm unfortunately very tight on material, so it may not even be possible. Is it worth the struggle to add just an inch or two? Ok. Getting back on track here. I've decided to make the cover trench coat from the Japanese coat book. It's been while, and I have to admit that it's been easy to drift into pre-printed patterns. It's been a treat to open up an envelope and, VOILA.... a pattern and instructions in English. 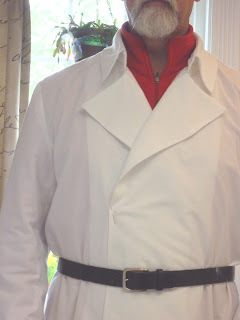 But I have all the materials to make the trench coat, so it only makes sense to move forward with it. Plus it would be really nice to have this coat for fall. For those of you not familiar with Japanese patterns, the book above is sitting on the pattern sheet. All the pattern pieces are overlapped onto a single sheet. It's like finding the hidden pictures in the kid's magazine Highlights. Hmmm. where's the collar stand? 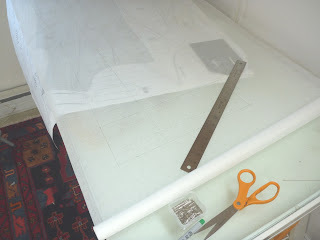 Once again I'll extol the virtues of Swedish Tracing Paper. 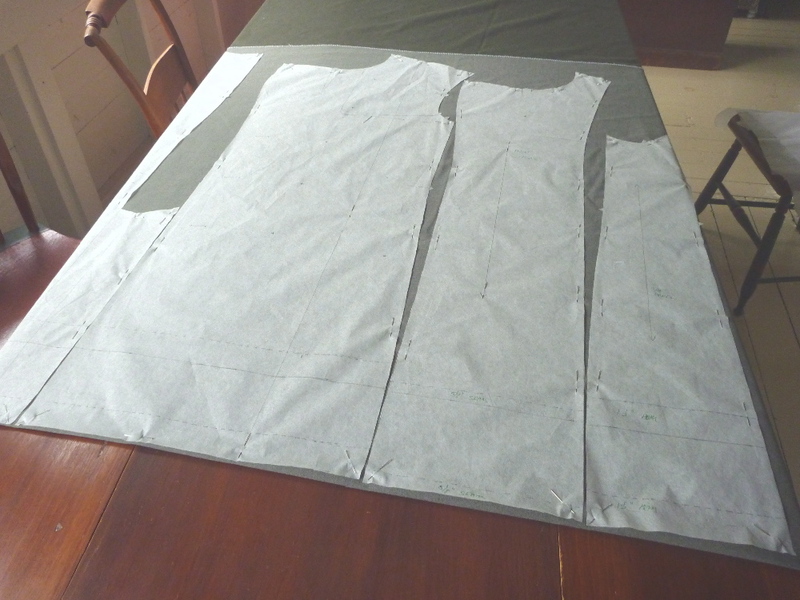 Here I've rolled it out over the pattern sheet. It's translucent and very durable. I find a pattern piece to trace and pin the tracing paper onto the pattern sheet. 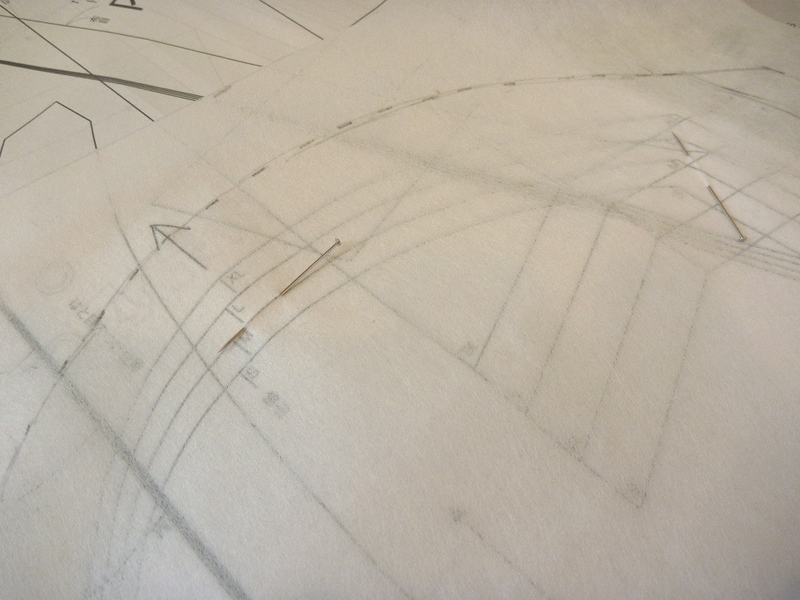 It's a good idea to let your eye follow the shape all the way around before tracing. There are so many intersecting lines that it's very easy to get mixed up and get off track. It's best to know where you're headed. 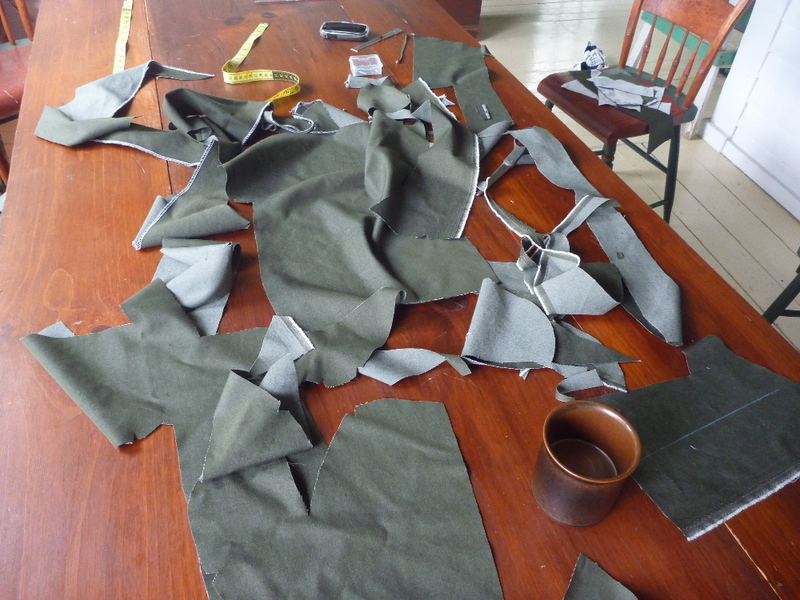 None of the pattern pieces include seam allowances or hems. I use a small ruler and make little dashes all around the pattern piece at 5/8" with a pencil. Then it's just a matter of connecting the dots. Easy but tedious. I've learned from my previous 2 coats that the Japanese size XL isn't even a size M by American standards. I was able to alter this pattern during the tracing process. I increased the shoulder width by 3/4". This ends up giving me an additional 3" in circumference of the coat. Jumping ahead, the sleeves ended up being about 2" too long on the muslin. 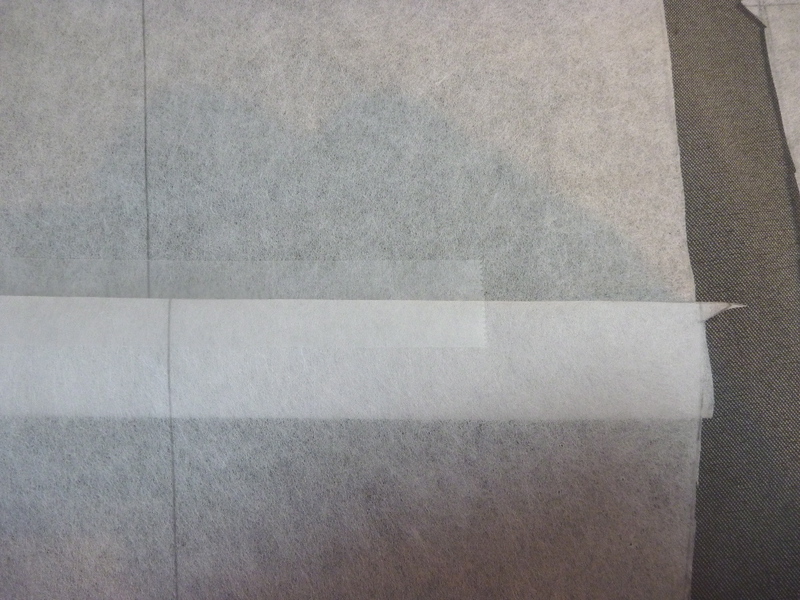 The tracing paper makes this an easy adjustment to make. I simply take up a 1" fold while at the same time maintaining the grain line. A little piece of tape and it's done. 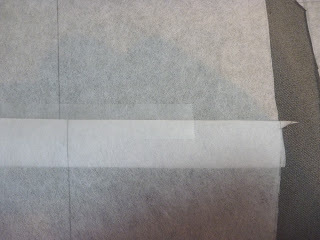 Here you see the fold taped into place. The pencil line is the grainline which must be maintained. The worst is truly over at this point. 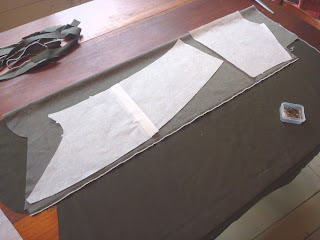 On to making the fitting muslin.